Did you ever think the way you look after the gym would be a runway staple? Us either. 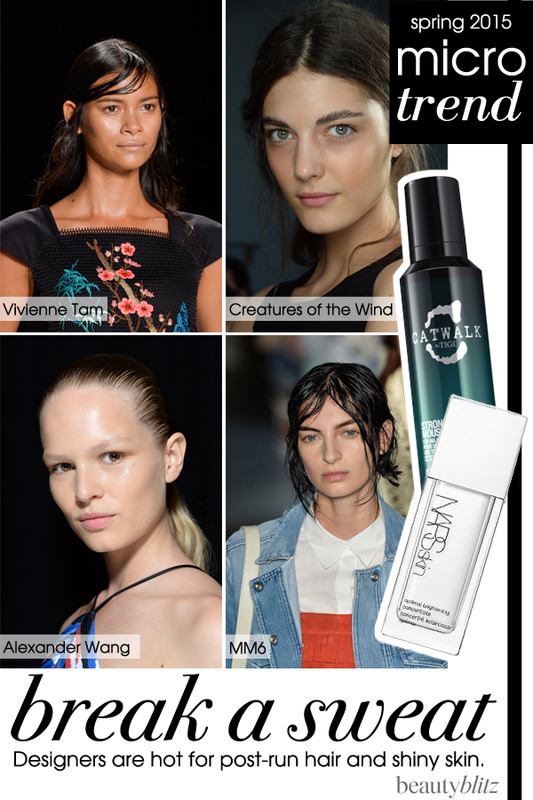 But “sweaty,” “swampy” and ”overheated” were just a few words that described multiple beauty looks at the spring 2015 shows, giving us more of a reason to accomplish those 10,000 steps on our Jawbones. At Alexander Wang, Diane Kendall for NARS gave models shiny cheeks and foreheads using NARSSkin Luminous Moisture Cream ($62) and Optimal Brightening Concentrate ($74). The “strong and energetic” look paired well with the designer’s sneaker-inspired dresses. Meanwhile, at Vivienne Tam, Catwalk by TIGI Creative Director Nick Irwin made the models look like their bangs got stuck to their sweaty foreheads. Yet, they still looked really cool. The “modern, sporty look” was achieved with Catwalk by TIGI Strong Hold Mousse ($15.99). And at Creatures of the Wind, NARS’ James Boehmer created “flushed, overheated cheeks” using lipstick, while James Pecis for Bumble and bumble gave models “swampy and sweaty” hair at MM6 by Maison Martin Margiela.